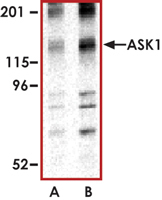 Sample Data :Western blot analysis of ASK1 in 3T3 cell lysate with ASK1 antibody at (A) 1 and (B) 2 ug/ml. Scientific Background :ASK1, also known as MAPKKK5, activates MKK3, MKK4 (SEK1), and MKK6. Overexpression of ASK1 induces apoptotic cell death, and ASK1 is activated in cells treated with tumor necrosis factor-alpha (1). ASK1 interacts with members of the TRAF family and is activated by TRAF2 in the TNF-signaling pathway. After activation by TRAF2, ASK1 activates MKK4, which in turn activates JNK. Thus, ASK1 is a mediator of TRAF2-induced JNK activation (2). 1. Smith, C. Ichijo, H. et al: Induction of apoptosis by ASK1, a mammalian MAPKKK that activates SAPK/JNK and p38 signaling pathways. Science 275: 90-94, 1997. 2. Nishitoh, H. et al: ASK1 is essential for JNK/SAPK activation by TRAF2. Molec. Cell 2: 389-395, 1998.